Hair loss can be an embarrassing problem for both men and women. In men, the most common cause of hair loss is Androgenic Alopecia, a disease that is most probably due to the hormone DHT. In the early stages of the hair loss due to this disease treatment can be with topical or oral medications. However in later stages hair transplant could be the only option. There are currently two different methods of hair transplant: FUT and FUE. FUT involves taking a strip of skin bearing hairs from the donor area of the scalp and then cutting the hair grafts into individual hair follicle units before transplanting them to the recipient areas. 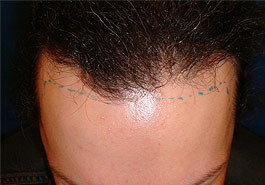 This method is suitable for patients who need lots of hair to be transplanted. FUE involves taking the hair grafts one at a time with a small skin punch. This method of hair transplant is made famous in the UK by the footballer Wayne Rooney. The advantage of this hair transplant method is quicker recovery and less noticeable scars in the donor area. Currently, most of our patients requests for FUE hair transplant but this method is less suitable if the hair loss is too advanced. Not many people know this but Cellite Clinic has been performing hair transplant in Cardiff since the year 2000. All the other clinics in Cardiff only hold the consultations in Cardiff and the treatments are done in other cities, or even countries. Being able to have hair transplant surgeries and follow-ups in Cardiff means more convenience and less costly for most patients. Cellite Clinic offers both methods of hair transplants (FUT and FUE) and also consultation for other causes of hair loss including female hair loss. Cellite Clinic is fully registered and regulated by the HIW for hair transplant surgeries.